Well, not exactly above the clouds but the pictures almost show my friends standing above or next to the clouds! The following are two of my favorite pictures that I took last weekend of my friends at our family ranch in Los Osos, in the central coast of California. The low cloud/ marine layer is actually several miles from where Joshua is standing. 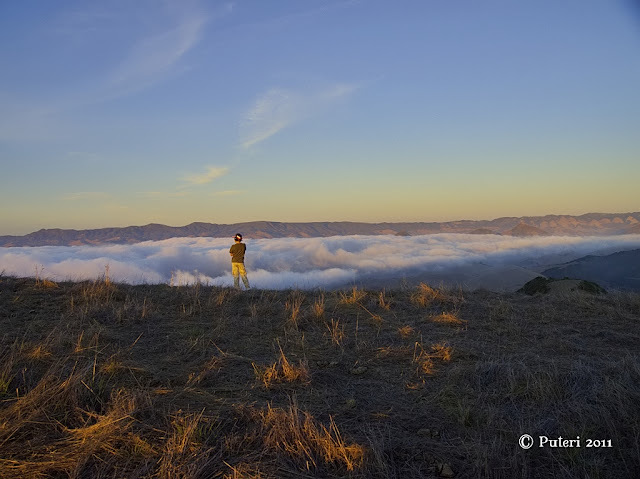 But from the angle the picture is taken it does look like the cloud or marine layer is right at the edge of the hillside from where he is. On a clear day, Morro Rock and the bay are visible from where Patty is standing. I especially love this picture. The soft evening colors, the low clouds, the ocean air - you can almost feel and smell them!